Imagine you are the owner of a small area of dull grey concrete, shaded by sur­rounding trees and with low walls. The ques­tion is how to liven it up and yet not lose the interest of the trees and woodland beyond. The answer is to build a garden like this, which is made part of its surroundings by its clever design. What could be a dull concrete area is given character and life by bringing the surroundings closer, and it has been made fun by the checkerboard design of the floor, against which the plants and pots are brilliantly shown off. The plants are largely limited to the outer boundary so they do not compete with the strong statement of the floor. 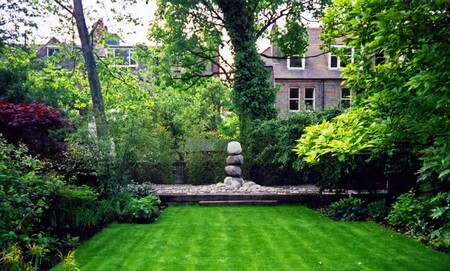 This garden is all about the interplay between elements within the garden and the wider environment. Simplicity and bold pat­terns make a powerful statement. This is an individual garden with lots of character, very carefully thought out and yet put together to appear relaxed and informal. The garden is built on a roof space that is not constructed to hold a great deal of weight, so the plants are limited to the outer areas, close to the parapet, which is strong enough to bear their weight. The strength of this simple and easily main­tained design lies in the very bold black and white paving used to floor the area. Privacy and wind are not a problem in this sheltered site, so no additional structures are needed, apart from the urns. There are no plants in the centre of the area, partly because of the weight-bearing problem and partly because the flooring is sufficiently attractive to need no additional decoration. 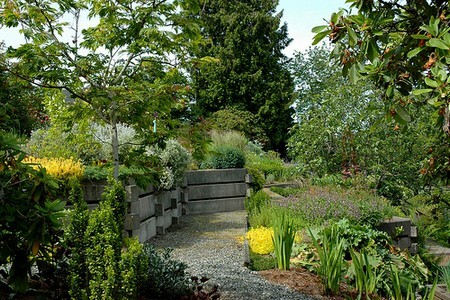 The parapet is high enough to provide shelter for the plants but low enough to permit views of the sur­rounding trees, and the planting around the edges takes the eye outwards, towards the canopy of the trees, and upwards to the sky. No additional height is added to the parapet in the form of a trellis, for example, because there are no young children using this garden. The birdtable provides extra height and a link between the branches of the surrounding trees and the garden. Casual furniture, in the form of a white lounger, chairs and a table, serves to empha­size the relaxed feel of this lightly shaded spot. The furniture harmonizes with the design of the floor, but does not draw atten­tion away from it. The containers used are all made of lightweight materials to avoid putting undue strain on the structure of the roof. The lack of planting and variety of colour in the central area is more than compensated for by having lots of bright flowering plants in the containers. The troughs are set into the parapet, thereby putting additional weight only where there is already support. The wall troughs are used to display colourful spring and summer flowers, and an informal effect is created by the random placing of containers to bring the planting gently towards the house. The two large urns on the corners of the parapet add height to the otherwise plain structure, and they draw the eye upwards. They can be planted with trailing evergreens or colourful flowers. Plants have been chosen that enjoy semi-shaded conditions, and perennials like the trailing Pelargonium ‘Orange Appeal’ will not only add bright colours to the wall but soften it with their tumbling foliage. Bright splashes of colour are provided by Gerbera jamesonii and Begonia ‘Merry Christmas’. The trees outside the garden are reflected in miniature within it by having two small trees, Griselinia littorialis ‘Dixon’s Cream’ and Magnolia liliiflora ‘Nigra’, growing in containers, placed at opposite sides of the garden to reflect each other. The griselinia has beautiful green-gold leaves and makes a good windbreak.